For the scientific journal, see Oceanography (journal). "Ocean science" redirects here. For the scientific journal, see Ocean Science (journal). Oceanography (compound of the Greek words ὠκεανός meaning "ocean" and γράφω meaning "write"), also known as oceanology, is the study of the physical and biological aspects of the ocean. It is an important Earth science, which covers a wide range of topics, including ecosystem dynamics; ocean currents, waves, and geophysical fluid dynamics; plate tectonics and the geology of the sea floor; and fluxes of various chemical substances and physical properties within the ocean and across its boundaries. These diverse topics reflect multiple disciplines that oceanographers blend to further knowledge of the world ocean and understanding of processes within: astronomy, biology, chemistry, climatology, geography, geology, hydrology, meteorology and physics. Paleoceanography studies the history of the oceans in the geologic past. Map of the Gulf Stream by Benjamin Franklin, 1769–1770. Courtesy of the NOAA Photo Library. Although Juan Ponce de León in 1513 first identified the Gulf Stream, and the current was well known to mariners, Benjamin Franklin made the first scientific study of it and gave it its name. Franklin measured water temperatures during several Atlantic crossings and correctly explained the Gulf Stream's cause. Franklin and Timothy Folger printed the first map of the Gulf Stream in 1769–1770. Information on the currents of the Pacific Ocean was gathered by explorers of the late 18th century, including James Cook and Louis Antoine de Bougainville. James Rennell wrote the first scientific textbooks on oceanography, detailing the current flows of the Atlantic and Indian oceans. During a voyage around the Cape of Good Hope in 1777, he mapped "the banks and currents at the Lagullas". He was also the first to understand the nature of the intermittent current near the Isles of Scilly, (now known as Rennell's Current). Sir James Clark Ross took the first modern sounding in deep sea in 1840, and Charles Darwin published a paper on reefs and the formation of atolls as a result of the second voyage of HMS Beagle in 1831–1836. Robert FitzRoy published a four-volume report of Beagle's three voyages. In 1841–1842 Edward Forbes undertook dredging in the Aegean Sea that founded marine ecology. The first superintendent of the United States Naval Observatory (1842–1861), Matthew Fontaine Maury devoted his time to the study of marine meteorology, navigation, and charting prevailing winds and currents. His 1855 textbook Physical Geography of the Sea was one of the first comprehensive oceanography studies. Many nations sent oceanographic observations to Maury at the Naval Observatory, where he and his colleagues evaluated the information and distributed the results worldwide. Despite all this, human knowledge of the oceans remained confined to the topmost few fathoms of the water and a small amount of the bottom, mainly in shallow areas. Almost nothing was known of the ocean depths. The British Royal Navy's efforts to chart all of the world's coastlines in the mid-19th century reinforced the vague idea that most of the ocean was very deep, although little more was known. As exploration ignited both popular and scientific interest in the polar regions and Africa, so too did the mysteries of the unexplored oceans. HMS Challenger undertook the first global marine research expedition in 1872. The seminal event in the founding of the modern science of oceanography was the 1872–1876 Challenger expedition. As the first true oceanographic cruise, this expedition laid the groundwork for an entire academic and research discipline. In response to a recommendation from the Royal Society, the British Government announced in 1871 an expedition to explore world's oceans and conduct appropriate scientific investigation. Charles Wyville Thompson and Sir John Murray launched the Challenger expedition. Challenger, leased from the Royal Navy, was modified for scientific work and equipped with separate laboratories for natural history and chemistry. Under the scientific supervision of Thomson, Challenger travelled nearly 70,000 nautical miles (130,000 km) surveying and exploring. On her journey circumnavigating the globe, 492 deep sea soundings, 133 bottom dredges, 151 open water trawls and 263 serial water temperature observations were taken. Around 4,700 new species of marine life were discovered. The result was the Report Of The Scientific Results of the Exploring Voyage of H.M.S. Challenger during the years 1873–76. Murray, who supervised the publication, described the report as "the greatest advance in the knowledge of our planet since the celebrated discoveries of the fifteenth and sixteenth centuries". He went on to found the academic discipline of oceanography at the University of Edinburgh, which remained the centre for oceanographic research well into the 20th century. Murray was the first to study marine trenches and in particular the Mid-Atlantic Ridge, and map the sedimentary deposits in the oceans. He tried to map out the world's ocean currents based on salinity and temperature observations, and was the first to correctly understand the nature of coral reef development. In the late 19th century, other Western nations also sent out scientific expeditions (as did private individuals and institutions). The first purpose built oceanographic ship, Albatros, was built in 1882. In 1893, Fridtjof Nansen allowed his ship, Fram, to be frozen in the Arctic ice. This enabled him to obtain oceanographic, meteorological and astronomical data at a stationary spot over an extended period. In 1881 the geographer John Francon Williams published a seminal book, Geography of the Oceans. Between 1907 and 1911 Otto Krümmel published the Handbuch der Ozeanographie, which became influential in awakening public interest in oceanography. The four-month 1910 North Atlantic expedition headed by John Murray and Johan Hjort was the most ambitious research oceanographic and marine zoological project ever mounted until then, and led to the classic 1912 book The Depths of the Ocean. The first acoustic measurement of sea depth was made in 1914. Between 1925 and 1927 the "Meteor" expedition gathered 70,000 ocean depth measurements using an echo sounder, surveying the Mid-Atlantic ridge. Sverdrup, Johnson and Fleming published The Oceans in 1942, which was a major landmark. The Sea (in three volumes, covering physical oceanography, seawater and geology) edited by M.N. Hill was published in 1962, while Rhodes Fairbridge's Encyclopedia of Oceanography was published in 1966. The Great Global Rift, running along the Mid Atlantic Ridge, was discovered by Maurice Ewing and Bruce Heezen in 1953; in 1954 a mountain range under the Arctic Ocean was found by the Arctic Institute of the USSR. The theory of seafloor spreading was developed in 1960 by Harry Hammond Hess. The Ocean Drilling Program started in 1966. Deep sea vents were discovered in 1977 by Jack Corliss and Robert Ballard in the submersible DSV Alvin. In the 1950s, Auguste Piccard invented the bathyscaphe and used the bathyscaphe Trieste to investigate the ocean's depths. The United States nuclear submarine Nautilus made the first journey under the ice to the North Pole in 1958. In 1962 the FLIP (Floating Instrument Platform), a 355-foot (108 m) spar buoy, was first deployed. From the 1970s, there has been much emphasis on the application of large scale computers to oceanography to allow numerical predictions of ocean conditions and as a part of overall environmental change prediction. An oceanographic buoy array was established in the Pacific to allow prediction of El Niño events. 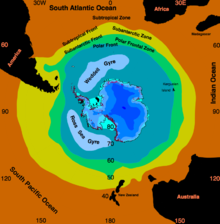 1990 saw the start of the World Ocean Circulation Experiment (WOCE) which continued until 2002. Geosat seafloor mapping data became available in 1995. In recent years studies advanced particular knowledge on ocean acidification, ocean heat content, ocean currents, the El Niño phenomenon, mapping of methane hydrate deposits, the carbon cycle, coastal erosion, weathering and climate feedbacks in regards to climate change interactions. Study of the oceans is linked to understanding global climate changes, potential global warming and related biosphere concerns. The atmosphere and ocean are linked because of evaporation and precipitation as well as thermal flux (and solar insolation). Wind stress is a major driver of ocean currents while the ocean is a sink for atmospheric carbon dioxide. All these factors relate to the ocean's biogeochemical setup. Biological oceanography investigates the ecology of marine organisms in the context of the physical, chemical and geological characteristics of their ocean environment and the biology of individual marine organisms. Chemical oceanography is the study of the chemistry of the ocean. Whereas chemical oceanography is primarily occupied with the study and understanding of seawater properties and its changes, ocean chemistry focuses primarily on the geochemical cycles. The following is a central topic investigated by chemical oceanography. 2) emissions into the atmosphere. Seawater is slightly alkaline and had a preindustrial pH of about 8.2. More recently, anthropogenic activities have steadily increased the carbon dioxide content of the atmosphere; about 30–40% of the added CO2 is absorbed by the oceans, forming carbonic acid and lowering the pH (now below 8.1) through ocean acidification. The pH is expected to reach 7.7 by the year 2100. An important element for the skeletons of marine animals is calcium, but calcium carbonate becomes more soluble with pressure, so carbonate shells and skeletons dissolve below the carbonate compensation depth. Calcium carbonate becomes more soluble at lower pH, so ocean acidification is likely to affect marine organisms with calcareous shells, such as oysters, clams, sea urchins and corals, and the carbonate compensation depth will rise closer to the sea surface. Affected planktonic organisms will include pteropods, coccolithophorids and foraminifera, all important in the food chain. In tropical regions, corals are likely to be severely affected as they become less able to build their calcium carbonate skeletons, in turn adversely impacting other reef dwellers. The current rate of ocean chemistry change seems to be unprecedented in Earth's geological history, making it unclear how well marine ecosystems will adapt to the shifting conditions of the near future. Of particular concern is the manner in which the combination of acidification with the expected additional stressors of higher temperatures and lower oxygen levels will impact the seas. Geological oceanography is the study of the geology of the ocean floor including plate tectonics and paleoceanography. Physical oceanography studies the ocean's physical attributes including temperature-salinity structure, mixing, surface waves, internal waves, surface tides, internal tides, and currents. The following are central topics investigated by physical oceanography. Since the early ocean expeditions in oceanography, a major interest was the study of the ocean currents and temperature measurements. The tides, the Coriolis effect, changes in direction and strength of wind, salinity and temperature are the main factors determining ocean currents. 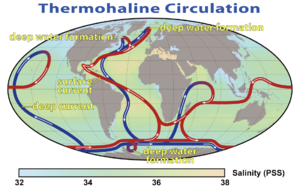 The thermohaline circulation (THC) (thermo- referring to temperature and -haline referring to salt content) connects the ocean basins and is primarily dependent on the density of sea water. It is becoming more common to refer to this system as the 'meridional overturning circulation' because it more accurately accounts for other driving factors beyond temperature and salinity. Examples of sustained currents are the Gulf Stream and the Kuroshio Current which are wind-driven western boundary currents. Oceanic heat content (OHC) refers to the heat stored in the ocean. The changes in the ocean heat play an important role in sea level rise, because of thermal expansion. Ocean warming accounts for 90% of the energy accumulation from global warming between 1971 and 2010. Paleoceanography is the study of the history of the oceans in the geologic past with regard to circulation, chemistry, biology, geology and patterns of sedimentation and biological productivity. Paleoceanographic studies using environment models and different proxies enable the scientific community to assess the role of the oceanic processes in the global climate by the re-construction of past climate at various intervals. Paleoceanographic research is also intimately tied to paleoclimatology. The first international organization of oceanography was created in 1902 as the International Council for the Exploration of the Sea. In 1903 the Scripps Institution of Oceanography was founded, followed by Woods Hole Oceanographic Institution in 1930, Virginia Institute of Marine Science in 1938, and later the Lamont-Doherty Earth Observatory at Columbia University, and the School of Oceanography at University of Washington. In Britain, the National Oceanography Centre (an institute of the Natural Environment Research Council) is the successor to the UK's Institute of Oceanographic Sciences. In Australia, CSIRO Marine and Atmospheric Research (CMAR), is a leading centre. In 1921 the International Hydrographic Bureau (IHB) was formed in Monaco. ^ Lee, Sidney, ed. (1896). "Rennell, James" . Dictionary of National Biography. 48. London: Smith, Elder & Co.
^ a b Rice, A. L. (1999). "The Challenger Expedition". Understanding the Oceans: Marine Science in the Wake of HMS Challenger. Routledge. pp. 27–48. ISBN 978-1-85728-705-9. ^ "Sir John Murray (1841–1914) – Founder Of Modern Oceanography". Science and Engineering at The University of Edinburgh. Archived from the original on 28 May 2013. Retrieved 7 November 2013. ^ Williams, J. Francon (1881) The Geography of the Oceans: Physical, Historical, and Descriptive George Philip & Son. ^ Otto Krümmel (1907). "Handbuch der Ozeanographie". J. Engelhorn. ^ Sverdrup, Harald Ulrik; Johnson, Martin Wiggo; Fleming, Richard H. (1942). The Oceans, Their Physics, Chemistry, and General Biology. New York: Prentice-Hall. ^ "Oceanography | science". Encyclopedia Britannica. Retrieved 2019-04-13. ^ Caldeira, K.; Wickett, M. E. (2003). "Anthropogenic carbon and ocean pH" (PDF). Nature. 425 (6956): OS11C-0385. Bibcode:2001AGUFMOS11C0385C. doi:10.1038/425365a. PMID 14508477. ^ "Ocean Acidity". EPA. 13 September 2013. Retrieved 1 November 2013. ^ Feely, R. A.; et al. (July 2004). "Impact of Anthropogenic CO2 on the CaCO3 System in the Oceans". Science. 305 (5682): 362–366. Bibcode:2004Sci...305..362F. doi:10.1126/science.1097329. PMID 15256664. ^ Zeebe, R. E.; Zachos, J. C.; Caldeira, K.; Tyrrell, T. (4 July 2008). "OCEANS: Carbon Emissions and Acidification". Science. 321 (5885): 51–52. doi:10.1126/science.1159124. PMID 18599765. ^ Gattuso, J.-P.; Hansson, L. (15 September 2011). Ocean Acidification. Oxford University Press. ISBN 978-0-19-959109-1. OCLC 730413873. ^ a b "Ocean acidification". Department of Sustainability, Environment, Water, Population & Communities: Australian Antarctic Division. 28 September 2007. Retrieved 17 April 2013. ^ Pinet, Paul R. (1996). Invitation to Oceanography. West Publishing Company. pp. 126, 134–135. ISBN 978-0-314-06339-7. ^ "What is Ocean Acidification?". NOAA PMEL Carbon Program. Retrieved 15 September 2013. ^ Orr, James C.; et al. (2005). "Anthropogenic ocean acidification over the twenty-first century and its impact on calcifying organisms" (PDF). Nature. 437 (7059): 681–686. Bibcode:2005Natur.437..681O. doi:10.1038/nature04095. PMID 16193043. Archived from the original (PDF) on 25 June 2008. ^ Cohen, A.; Holcomb, M. (2009). "Why Corals Care About Ocean Acidification: Uncovering the Mechanism" (PDF). Oceanography. 24 (4): 118–127. doi:10.5670/oceanog.2009.102. Archived from the original (PDF) on 2013-11-06. ^ Hönisch, Bärbel; Ridgwell, Andy; Schmidt, Daniela N.; Thomas, E.; et al. (2012). "The Geological Record of Ocean Acidification". Science. 335 (6072): 1058–1063. Bibcode:2012Sci...335.1058H. doi:10.1126/science.1208277. hdl:1983/24fe327a-c509-4b6a-aa9a-a22616c42d49. PMID 22383840. ^ Gruber, N. (18 April 2011). "Warming up, turning sour, losing breath: ocean biogeochemistry under global change". Philosophical Transactions of the Royal Society A: Mathematical, Physical and Engineering Sciences. 369 (1943): 1980–96. Bibcode:2011RSPTA.369.1980G. doi:10.1098/rsta.2011.0003. PMID 21502171. ^ IPCC (2013). Climate Change 2013: The Physical Science Basis (PDF) (Report). Cambridge University Press. p. 8. Wikisource has the text of the 1922 Encyclopædia Britannica article Oceanography. Wikimedia Commons has media related to Oceanography. NASA Jet Propulsion Laboratory – Physical Oceanography Distributed Active Archive Center (PO.DAAC). A data center responsible for archiving and distributing data about the physical state of the ocean. Scripps Institution of Oceanography. One of the world's oldest, largest, and most important centers for ocean and Earth science research, education, and public service. Woods Hole Oceanographic Institution (WHOI). One of the world's largest private, non-profit ocean research, engineering and education organizations. British Oceanographic Data Centre. A source of oceanographic data and information. NOAA Ocean and Weather Data Navigator. Plot and download ocean data. Freeview Video 'Voyage to the Bottom of the Deep Deep Sea' Oceanography Programme by the Vega Science Trust and the BBC/Open University. Atlas of Spanish Oceanography by InvestigAdHoc.
. A source of oceanographic live data (buoy monitoring) and education for South African coasts.